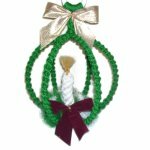 Description: The Crown Knot is frequently found in Macrame patterns, especially at the top of plant hanger designs. 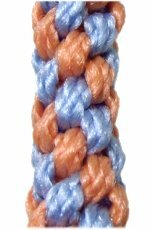 This decorative knot is primarily used to form sennits that make beautiful woven patterns, like this Spiral design shown here. 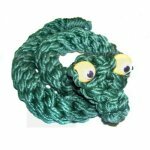 They are easy to make, and can be used for jewelry, pet collars, belts, animal designs, holiday ornaments, and much more. 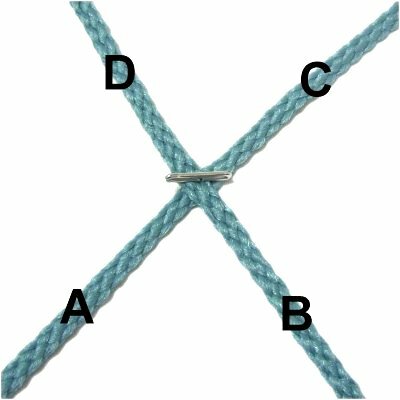 On this page are three different designs, all based on the single Crown Knot, which is described first. Beginners should practice all the designs on this page. 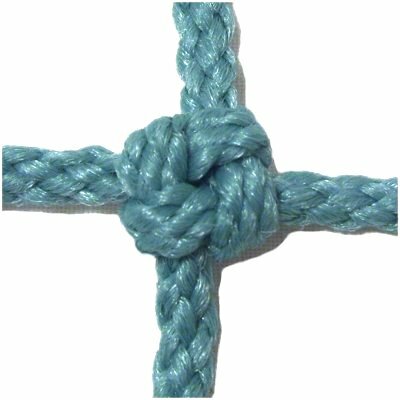 You need two cords, at least 18 inches long, to practice making a single Crown Knot. In some Macrame projects, you will secure the cords to a board. That's the easiest way to make them, which is why you should use a board when practicing. 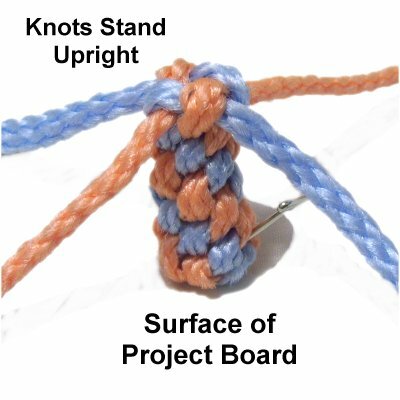 In other projects, you may be asked to make them with the cords coming from other knots. This occurs often with plant hanger designs, where these knots are placed close to the top of the design. In that case, the best way to tie them is by holding the cords between your knees upside down. The cords are not crossed, so you would skip step 1. Step 1: Match the centers of the two cords. Arrange them in an X shape, and secure them at the center. Mentally label the four segments as shown, starting with the one on the lower left. Step 2: Fold Segment A to the right, arranged horizontally, passing over Segment B. Leave some space at the corner and secure it with a pin. Designer's Tip: When you fold a cord, you don't just make a curve. You turn the cord upside down after the corner is made. The bottom surface that was touching the board will be face up when you are through. This will make more sense when you see the following images, where the folding is more obvious. Be sure to click on the small images to view the large ones, so you can see the details better. 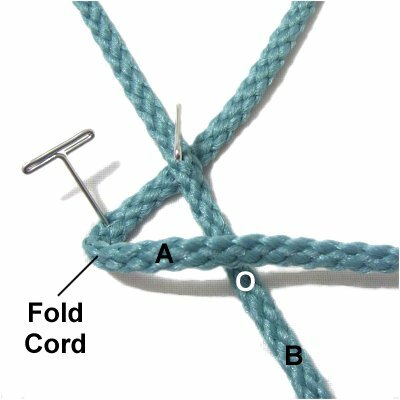 Step 3: Fold Segment B vertically, passing over Segments A and C.
It helps if you secure each cord after you fold it. Step 4: Fold Segment C to the left, passing over Segments B and D.
Step 5: Fold Segment D forward (towards you), passing over Segment C.
Pass it through the space at the corner of Segment A, over - under the two parts. Step 6: Tighten the Crown Knot slowly, one segment at a time. Don't remove the pin in the center until it's almost completely tightened. 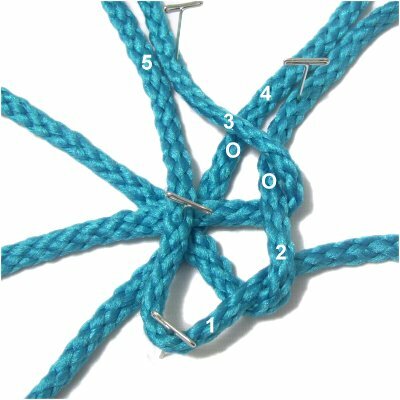 The Spiral Design is the most common type of Crown Knot sennit you will find in Macrame projects. 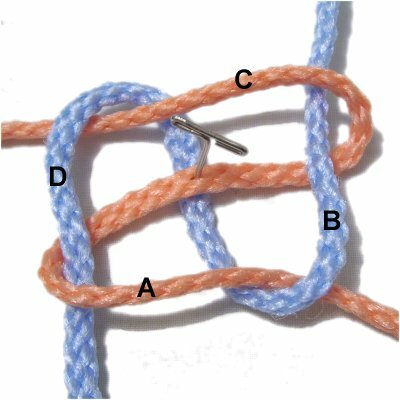 You will be able to see the diagonal progression of the knots if you use two colors. The Serpent is an easy project featuring the Spiral design. The Holiday Lantern features a candle made with the same technique. Preparation: You need two cords, at least 36 inches long (to practice). 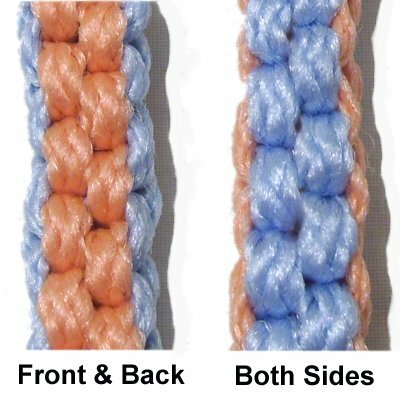 In a Macrame project, the cords need to be 12 x the length you are trying to make. So for a 6-inch sennit, you need at least 72 inches of material. Step 1: Repeat steps 1 - 5 from the instructions for the single knot. Step 2: Repeat step 6 as well, tightening the first knot. Take note of where the four segments are arranged now. They are vertical and horizontal, with Segment A on the right. 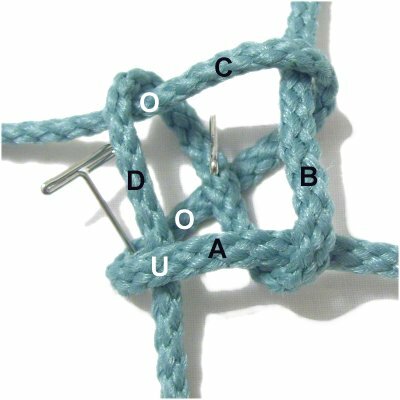 Step 3: Turn the knot slightly to the left, so the four segments are diagonal again. 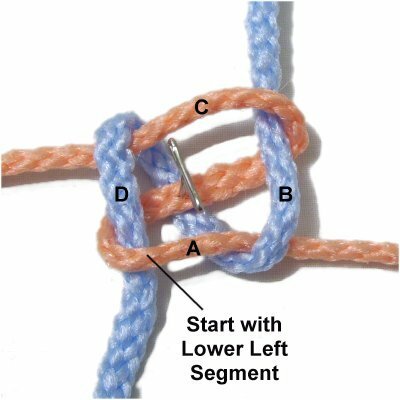 Segment D is on the lower left, which is ALWAYS where you start each knot. So you begin with a different color this time, if you are using two. Step 4: Mentally re-label the segments where they are positioned now. 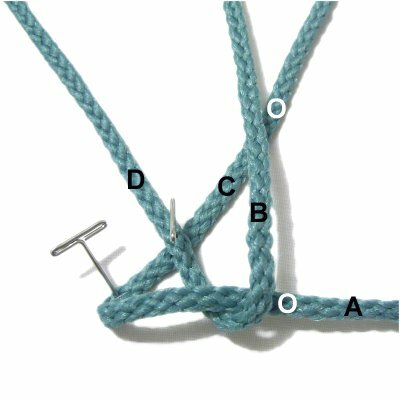 Repeat steps 1 - 5 from the single knot instructions. Remember to move counter-clockwise, starting with the segment on the lower left. 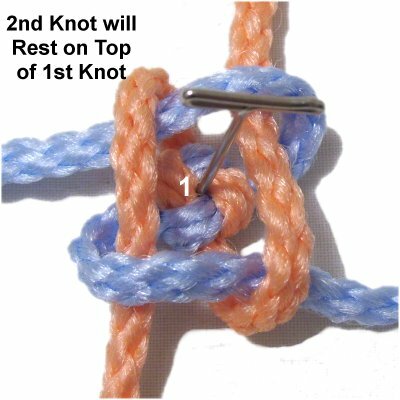 Step 5: When you tighten the second Crown Knot, it will rest on top of the first knot, which is labeled with a (1) in this image. Step 6: Repeat steps 1 - 6 several more times. The knots will stack on top of each other, so the sennit will be standing upright. 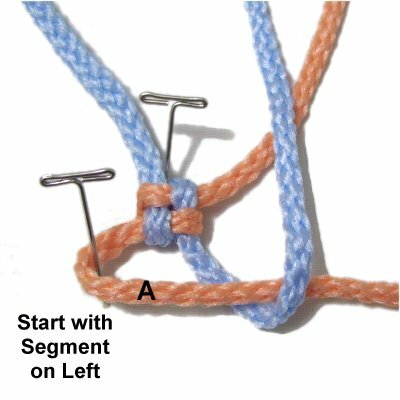 Remember to always start each knot with the segment on the lower left. The colors will alternate to form the Spiral design as long as you continue to move counter-clockwise. When using one color, the spiral pattern won't be as obvious, but it will still look interesting. 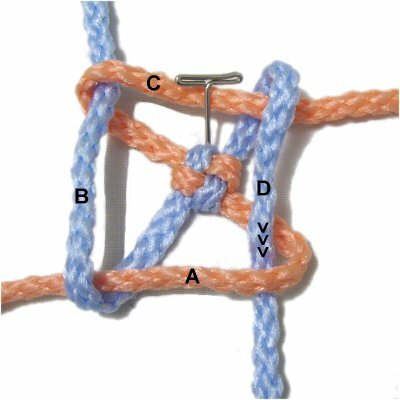 Description: This unique Crown Knot sennit results in knots arranged vertically on four flat surfaces. So this sennit will be rectangular rather than round. The front and back will be one color and the sides will be the other color. I recommend you use two colors when practicing, so you can clearly see the design. 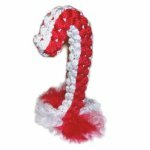 The Candy Cane Decoration is a fun project you can make to master this Vertical Design. Preparation: To practice, you need two cords, at least 36 inches long. 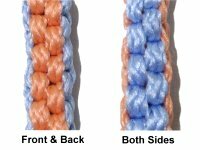 In a Macrame project, you need 12 x the finished length you are trying to make. Arrange the cords in an X shape, secured in the center. Mark the segment on the lower left with a piece of tape, and mentally label it segment A.
Mentally label the other segments in a counter-clockwise direction. 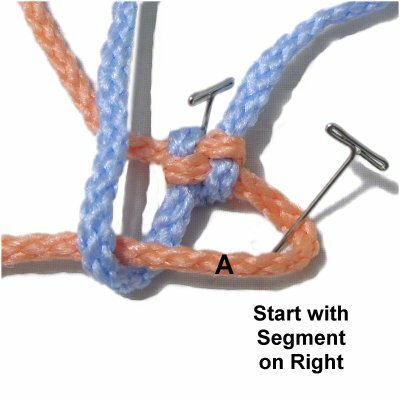 Step 1: Make the first Crown Knot as described in the instructions for the single knot. Make sure you start with the marked segment (A). 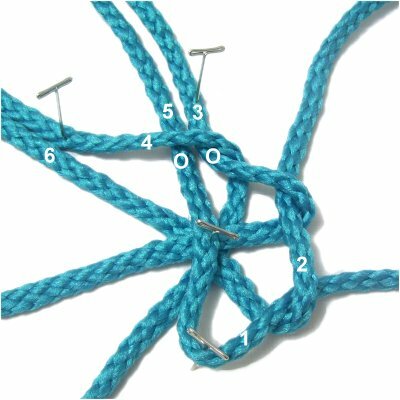 Step 2: After you tighten the first knot, turn it just a little, so the cords form an X shape again (diagonal). 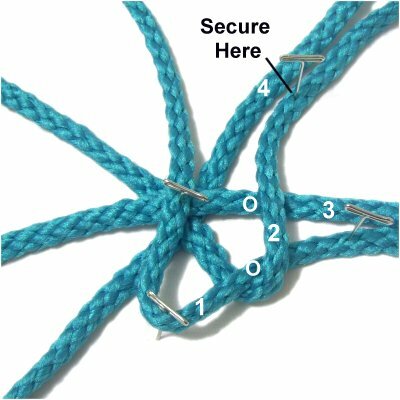 Secure the knot on the outside rather than the center. The marked cord is now on the lower right, and it is still labeled A. Mentally re-label the other segments, moving clockwise. Designer's Tip: This type of Crown Knot will not work if the knots are moved too much. The marked cord must ALWAYS remain in the lower left or lower right position. 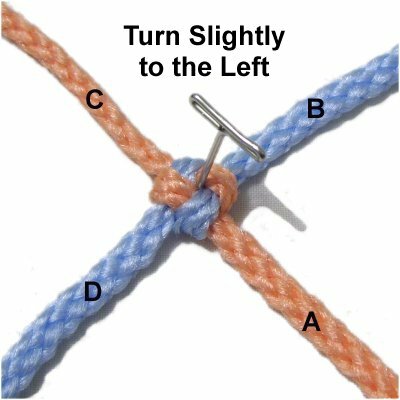 Placing the pin on the outside will help keep it in place, but you will need to move the knot slightly, since the cords should always start out diagonal. 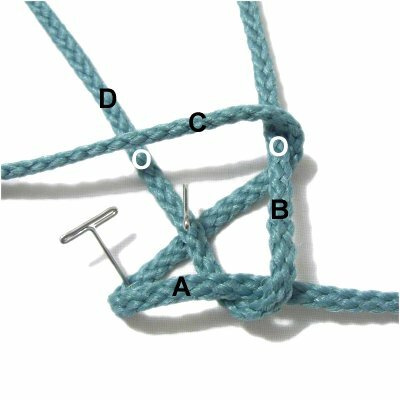 Step 3: Start the second knot by folding the marked segment (A) to the left, over segment B. Remember to leave a space. Fold segment B over segments A and C.
Fold segment C over segments B and D.
Fold segment D over C, then through the space made by segment A. Step 5: Mentally re-label the cords, starting with the marked cord on the lower left (A) and moving counter-clockwise. 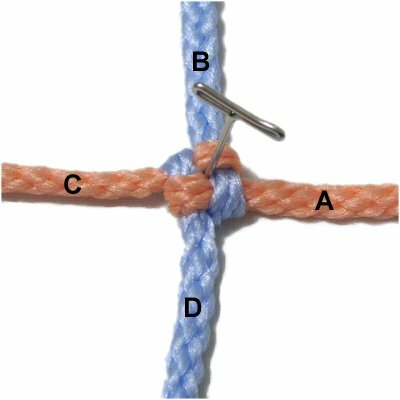 Repeat step 1 to tie the third Crown Knot. 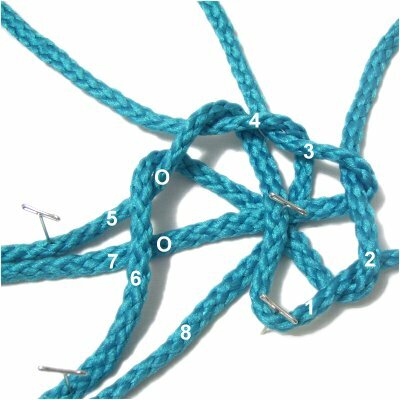 Step 6: Repeat steps 2 - 4, tying the fourth knot in a clockwise direction. 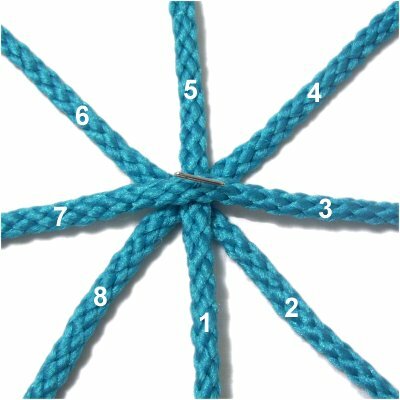 Step 7: Repeat steps 5 and 6 several times, until the Crown Knot is the size you want to make. 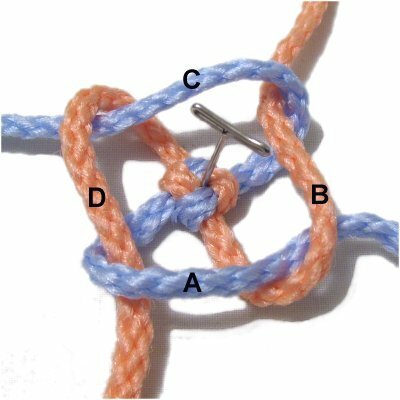 Description: A single Crown Knot can be tied with multiple cords to form a circular shape. 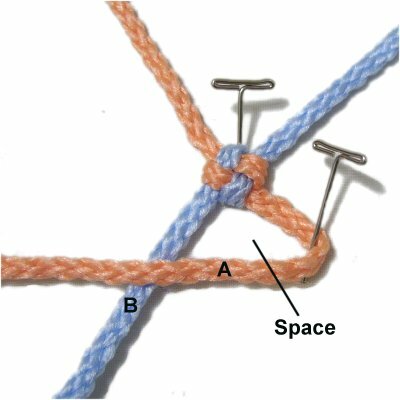 It's a great technique to use in the center of a Macrame design where you need attachment points for other cords. A flower can be made using this technique. It doesn't work out well with material less than 4mm thick. 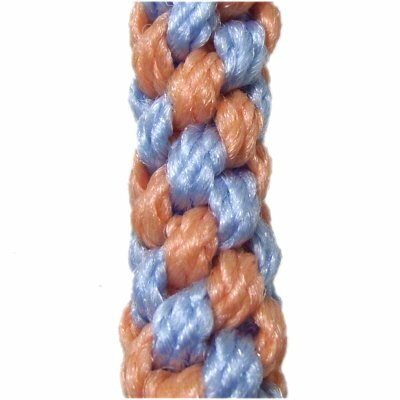 In the example shown, 6mm size Bonnie Braid (Olefin) was used to make the Crown Circle. Preparation: To practice, you need 4 cords, each at least 20 inches long. 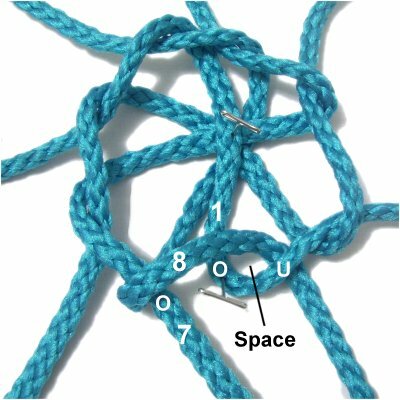 In a Macrame project, increase the cord lengths by 12 inches if you plan to use this knot. Step 1: Arrange two cords diagonally, one vertically, and one horizontally. Match the centers and secure them with one pin. Mentally number the segments 1 - 8 as shown. Designer's Tip: You can secure the center of the cords to your board when practicing. 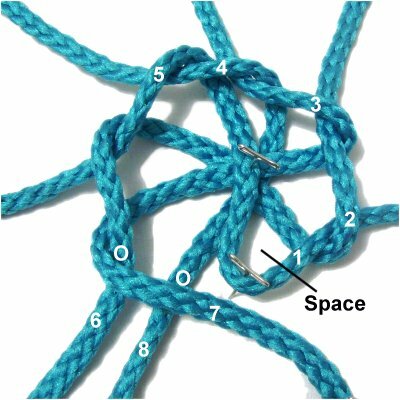 In a Macrame project, it's helpful if you tie a knot with one cord around the others, so it has a firmer base. Step 2: Fold segment 1 over segment 2, leaving a space at the corner. Secure it next to segment 3, and do not allow it to rest on top of it. 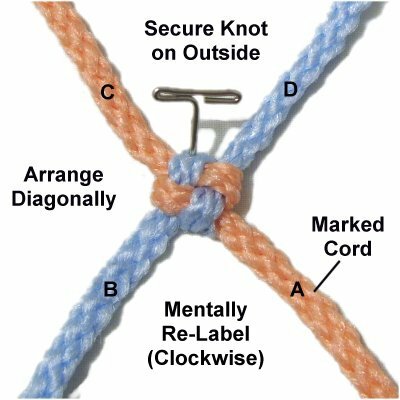 Designer's Tip: A complex Crown Knot can get confusing. Securing the cords in specific places will help you keep them organized. 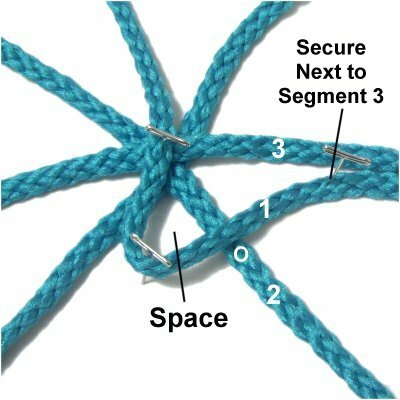 By securing segment 1 near segment 3, it makes them easy to identify for the next step. Step 3: Fold segment 2 over segments 1 and 3. Secure it next to segment 4. Step 4: Fold segment 3 over segments 2 and 4, which are close together. Secure it next to segment 5. Step 5: Fold segment 4 over segments 3 and 5. Secure it next to segment 6. Step 6: Fold segment 5 over segments 4 and 6. Secure it next to segment 7. Step 7: Fold segment 6 over segments 5 and 7. Secure it next to segment 8. Step 8: Fold segment 7 over segments 6 and 8. Secure it to the right of segment 8. Identify the space you left at the corner of segment 1. Step 9: Fold segment 8 over segment 7. Bring it through the space at the corner of segment 1, passing over - under the two parts. 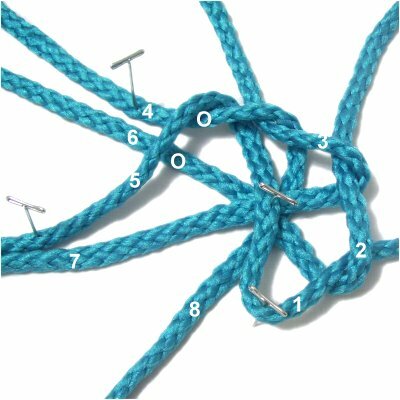 Step 10: Tighten the Crown Knot slowly, one segment at a time. Don't remove the pin in the center until it's the size you want. 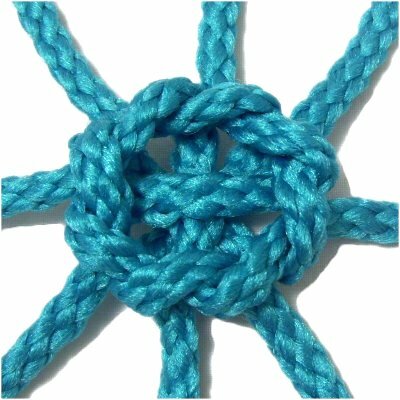 Have any comments about the Crown Knot? Contact Me.